On the day that was supposed to be Brexit: we count down on the last chance to plan for old contractor/EBT loans, we look at tax and the family, we consider lots of deadlines, a bit of R & D and there is more news on Making VAT Digital. On Making Tax Digital for VAT: HMRC confirmed yesterday that which we already knew: you cannot see your client list from within your Agent Services Account. You can though authorise clients from your ASA. HMRC have also just published quite a confusing guide to record keeping requirements under MVD. Hopefully, all you advisers will be reading our guides which take you through the requirements in a clearer way. Also out is a new consultation on capping R & D relief in order to avoid fraudulent claims by SMEs. There is lots of stuff on HMRC's site about a 'No Deal' Brexit, meanwhile the online 'Revoke Article 50' petition is nearly at 6 million signatures. Ignorning Brexit, this amount of online engagement will surely encourage HMRC in their future plans for Making all Taxes more Digital. My recommendation for this week's Essential Reading is a FREEVIEW case, Fearon is a bit of a refresher; it shows just what can happen if you run a personal service company and you overclaim subsistence expenses. It's easy to claim expenses, but you still need to check the rules before you allow them. This week we have had a mad rush on queries on family companies, incorporation, gifting shares and negligible value share loss claims. These are all for last-minute, year-end planning and so we have updated many FAQs sections in our relevant guides, which are listed below. Time is running out to register to settle outstanding disguised remuneration loans. I can see that some people are preferring the expensive option to pay the loan charge. This is rarely a binary decision, you need to cost out the different options depending on the type of scheme. If you have any tax queries please do try out our Virtual Tax Partner support portal at www.VtaxP.co.uk. Please note that we are exceptionally busy with queries due to the time of year. HMRC has published 'Preventing abuse of the R&D tax relief for SMEs' a new consultation. It considers how the new cap on R & D relief may apply to loss making SMEs. UPDATE: all our guides, tools and top tips on getting to grips with the new VAT rules. Many families and High Net Worth Individuals (HNWIs) use corporate structures as a vehicle for holding and making investments as an alternative to a family partnership or trust. This guide examines the tax consequences of creating new share classes in a family company in order to split income with a spouse or close family members. There is no general tax exemption for when a married couple or civil partners divorce or separate. A key issue is Capital Gains Tax (CGT), especially on transfers / disposals of the marital home or any jointly owned business. A loss made on the disposal of shares in a qualifying trading company, or a company which qualified for EIS or SEIS relief, may be claimed to be offset against income instead of the normal capital treatment. Disguised remuneration: settle now or pay the loan charge? In Kevin Fearon v HMRC  TC6818 the FTT found rejected an appeal against four years of tax assessments and penalties for incorrectly claimed subsistence expenses. The errors were deliberate and 56% penalties applied. In Harrison Solway Logistics Ltd v HMRC  TC06956 the First Tier Tribunal allowed appeals against Benefit in Kind charges for company cars where the directors repaid the leasing costs of those cars to the company. Where someone is acting as agent for a principal, it is possible that the income received by the agent on behalf of the principal is outside the scope of VAT for the agent. What is an agent for VAT purposes? When do these rules apply? 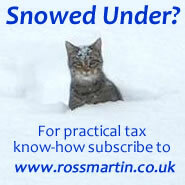 FULL access to www.rossmartin.co.uk: your firm's favourite TAX INTRANET containing over 3,500 actively maintained tax guides, briefings, toolkits and checklists. Structured CPD our detailed SME tax updates "for Advisers Only" provide topical summaries and planning notes & our webcasts provide you with structured CPD at your desk.